"The term ’ Cold Shrink’ is applied to materials, which are capable of shrinking without raising the material above the ambient temperature of its immediate surroundings. The Cold Shrink Accessories are supplied from the factory in a pre-expanded condition and placed on a removable core. Removing the core when properly positioned over the cables causes shrinking." Does not require heating by flaming or any special tools. Just pull out the plastic expansion core from the silicon rubber center and the stress cone will tightly shrink into position. Reliable, superior insulation with high-recovery elasticity; Denson Cold Shrink employs a special silicon rubber formulation which keeps its radial pressure. This permanently ensures the highest integrity of environmental & electrical protection. Superior hermetic sealing; for cable splicing, Denson has adopted a triple hermetic sealing technology. 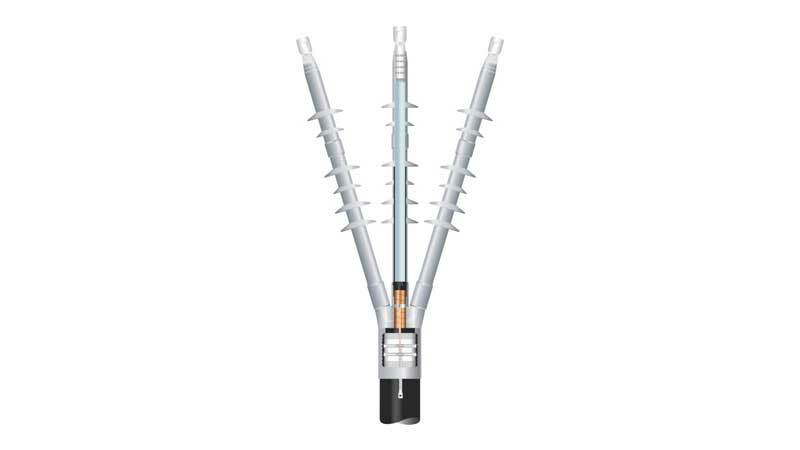 Easy/convenient installation: the carefully engineered dimensions of the pre-stressed cone provides for larger tolerances and eases installation. Wide Usage: Denson’s expansive customer base spans areas that pose great difficulties to electrical equipment usage. Our Cold Shrink product line has a long and proven track record showing superior performance in high pollution, salt laden, thermally divergent locations. The Cold Shrink accessories can be widely applied in various regions. It is especially well suited for high altitudes, cold weather, high-humidity, salt-fog & high-pollution regions.